Yesterday, we released a new version Evaer call recorder for Skype software. 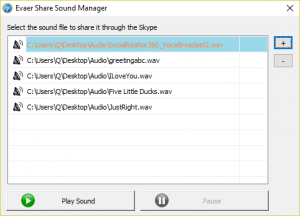 The new version Evaer video recorder has added a new tool – Evaer sound sharer. It can “Share music through the Skype call” . 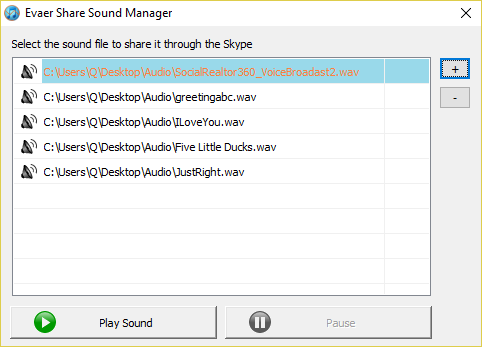 And the Evaer sound sharer for Skype is FREE. Please add the wave format file (16bit mono format) or MP3 file (It will auto convert it to a new wav format file) at Evaer Share Sound Manager program as below. Then click the “Play Sound” button to share the sound/music when the Skype call connected. You can pause/resume the playing at any time, also can switch to play other sound/music at any time. This entry was posted in Skype Video Recorder and tagged play music through the Skype call, Play sound through Skype call, share mp3 during the Skype call, share music on Skype call on March 24, 2017 by admin.